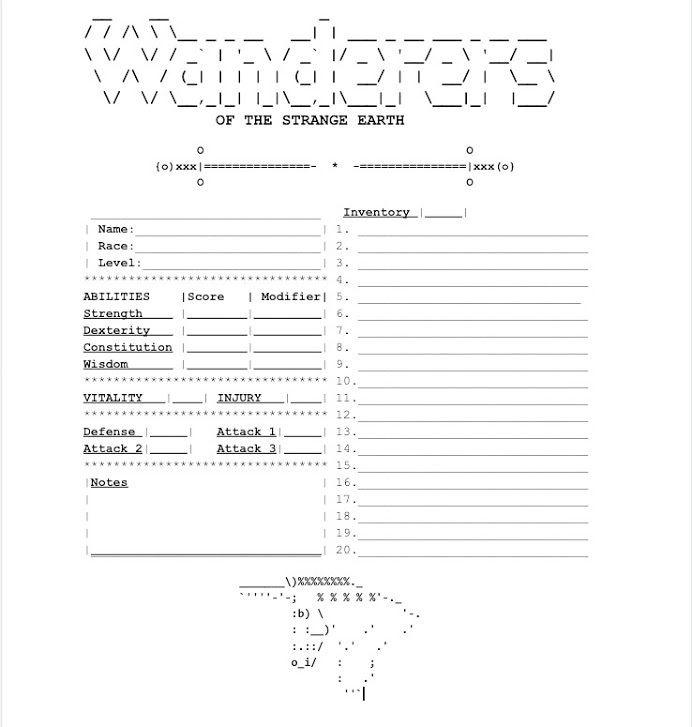 I revised the Wanderers Of The Strange Earth doc to be a d12 based system. The numbers work better I think. I still need to test it a bunch. Working on Wanderers. Ghost Star sold out. Thanks everyone who bought a copy of In The Light Of A Ghost Star! I’m not planning on making another batch except for some to sell locally in Shreveport. I was asked to do a book signing at the library. I’m thinking about that. I really want to run some open games at the library. Also Ghost Star is a copper seller on DriveThruRPG, I’m not sure what that means exactly. Maybe that you sold at least 50? I’ll probably sell copies here on my website again since I can make them pretty easily as they’re ordered. I’ll also make a booklet pdf with the pages in booklet order to make DIY printing easier. 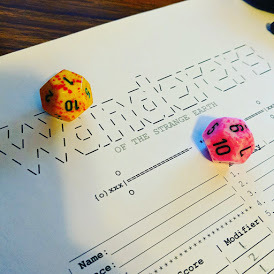 I started working on Wanderers Of The Strange Earth again. I stopped to focus on Ghost Star and also was having trouble getting motivated. It’s based on Knave and every time I hacked into it I kept changing it back to vanilla Knave cuz guess what? Knave is clean AF! That sucker is pretty tight and balanced and it feels like I’m screwing it up anytime I change it. Then I started doing that Descendants idea in my last post. That was fun but I think it’s gonna stay a thought experiment for a while. But I really like the combat idea. So I wrote out the rules of Wanderers, which is basically Knave and tried to fit that combat system into it. I’m bad at math so it’s going to take some time to get the numbers feeling right but I’m having fun with the combat test I’m doing by myself. Wanderers Of The Strange Earth is a fantasy role playing game built on Ben Milton's Knave rules tool kit. It is a work in progress. It’s about 75% done but I hit some writer’s block/burnout and focused on In The Light of A Ghost Star instead. Now that Ghost Light is finished I'll be getting back to Wanderers. Here is some artwork I’ve done while working on it.